I had been struggling to decide if I should stick with Instagram after they changed their terms of service. As luck would have it though it seems as though they are reverting back to the old terms of service due to the feedback from their customers!! Therefore I am going to continue posting on Instagram! Soooooo please follow me on Instagram! As I looked through the pictures I’ve shared on Instagram it was clear, I am obsessed with my dog. 90% of the pictures are of her. Ummm hello? Nicole it is time to take pictures of other things! 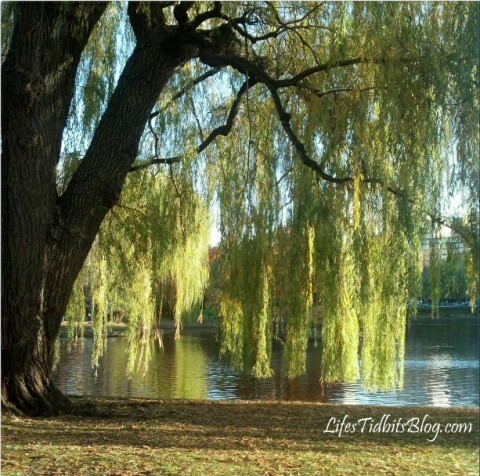 My favorite non-Sophi picture was taken in Boston of a willow tree. My oldest friend and I met for lunch over the Thanksgiving holiday and since it wasn’t too terribly cold so we took a little stroll through Boston Commons first. The lighting seemed perfect the way it was coming through the leaves. Although I really do love this picture I wonder if part of why I love this picture is because it reminds me of spending time with my friend. Either way … Happy Friday! Great photo! The light is beautiful.